Let me preface by saying that this fix assumes you have a MOSFET R/R like the Compufire I installed on mine. You may need to modify some steps to keep the stock R/R wiring. 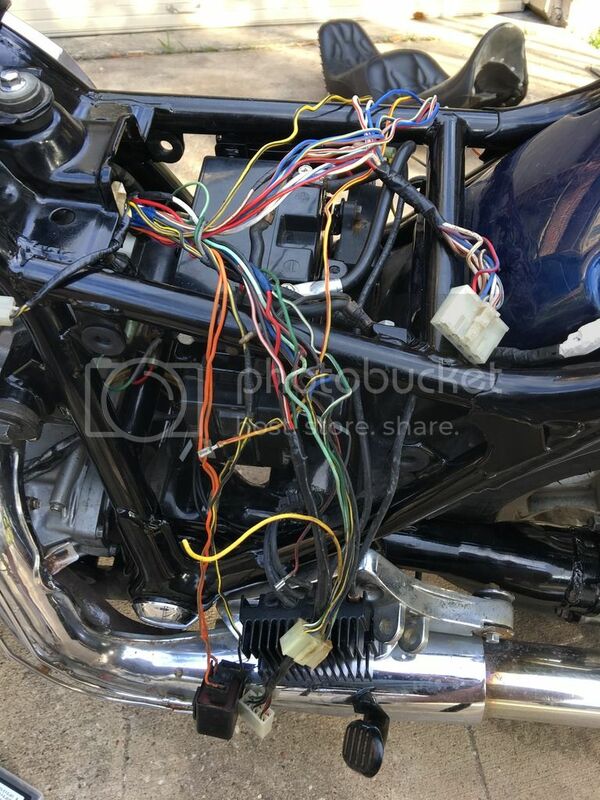 During the restoration of my '93 VN750, I unfortunately did not take the time to clean or modify the wiring harness to increase the reliability. I have been chasing electrical problems for about two months. My only modification as of a couple days ago was to get rid of the stock R/R and go to a MOSFET unit. Not long after I started having issues with the bike dying from losing power feed from the ignition switch, turned out to be full of dirt. My headlight also did not work, or the radiator fan. Next my starter solenoid died, then I lost power to the rear cylinder coil. Truly frustrating. The last straw was when I moved the main harness from under the tank to on top of the rear valve cover to make for a cleaner look, which interfered with removing the battery. So, after much research I decided to modify the entire harness from the petcock area to the back of the bike. Pin 1: White/Red wire coming from starter solenoid. Main power feed. Pin 2: White wire fed thru 30 amp fuse. Feeds ignition switch and the fan. Pin 3A: Lead for 1st accessory. Pin 3B: Lead for 2nd accessory. Pin 4: Black/Yellow wire to fan switch, grounds the fan relay. Pin 5: Blue wire, switched side of the fan relay, powers the fan. 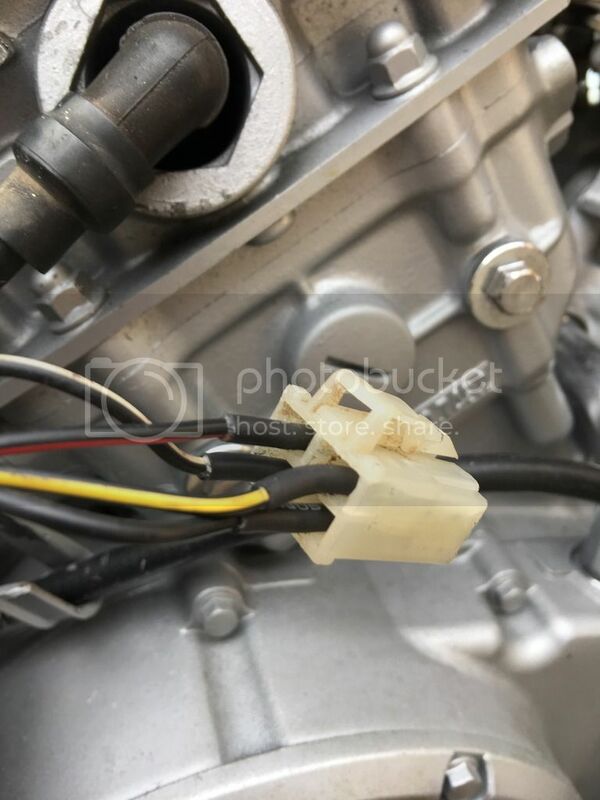 Pin 6: Brown/white wire fed from the ignition switch. Has power in the "ON" position. Pin 7: Normally left blank, used in bypassing the headlight relay. This is where the blue wire is moved to. Fed through 10 amp fuse. Pin 8: Blue wire, switched side of the headlight relay, sends power to the reserve lighting unit. Pin 9: Yellow wire from the stator, feeds power through a diode (since it's alternating current) to turn on the headlight relay. Once turned on the relay becomes self powered through another diode. Pin 11: Black/red wire (may vary on some years), feeds power to the starter safety relay from the starter button. Pin 12: Black wire (shows Y/G in the manual), grounds the relay if in neutral and/or the clutch is in. Pin 13: Yellow/red wire, switched side of starter safety relay. Feeds power to the starter solenoid. Pin 14: Black/white wire from the ignition module. Will kill ignition if not grounded. Pin 15: Light green wire, to the neutral switch. Pin 16: Green/white wire, to the kick-stand switch. Pin 17: Red/blue wire, fed power through 10 amp fuse for the tail lights. Upon inspection, it is evident that the headlight and starter safety relay circuits can be eliminated. Anyone who has owned a bike more than a month knows not to ride it with the kick stand down or start it in gear. Also, for anyone who has installed a R/R with leads that go straight to the battery, the stock R/R wiring can be gotten rid of. Re-read that underlined sentence. Be aware of the dangers of accidentally taking off with kickstand down or starting the bike in gear! Now that that's out of the way, we can determine how to get rid of the junction box entirely. The junction box is a never ending source of problems for Vulcan owners. I ordered replacement relays to fix mine, only to find that the inside was corroded. Good job Kawasaki engineers on the (lack of) weather sealing. 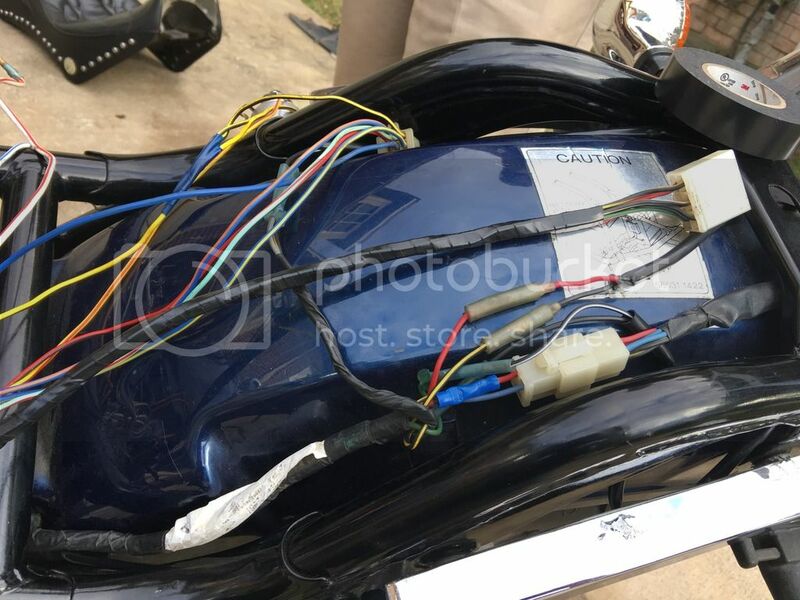 Another reason to do this is that by now your connectors are getting old and cracked, and tend to not survive being removed many times (as many Vulcan 750 owners have to do) to help diagnose electrical problems. Mine were pretty toast. lVluffin and Gaz73 like this. Last edited by mcinturff; 07-07-2017 at 11:16 PM. Let's start with the 10 pin connector: Pins 9, 12, 15, and 16 are no longer needed. The headlight is no longer switched (pin 9), no more starter lockout (pin 12), and no more ignition kill for the kickstand (pins 15 and 16). This means pins 11 and 13 can be shorted together to power the starter solenoid from the starter button, pins 4 and 5 can be ran to an external relay for the fan, and pin 14 can be grounded. Now the 8 pin connector: Pin 8 is eliminated since the headlight is no longer switched on. You may also choose to not use Pins 3A and 3B. This is what I did, since the electrical system is already taxed. A fuse block can be used that runs a 30 amp fuse between Pins 1 and 2, a 10 amp fuse between Pin 6 and 7, and a 10 amp fuse between Pin 6 and 17. You could run a 10 amp fuse between Pin 1 and Pin 3A/B if you choose to keep the accessory leads. 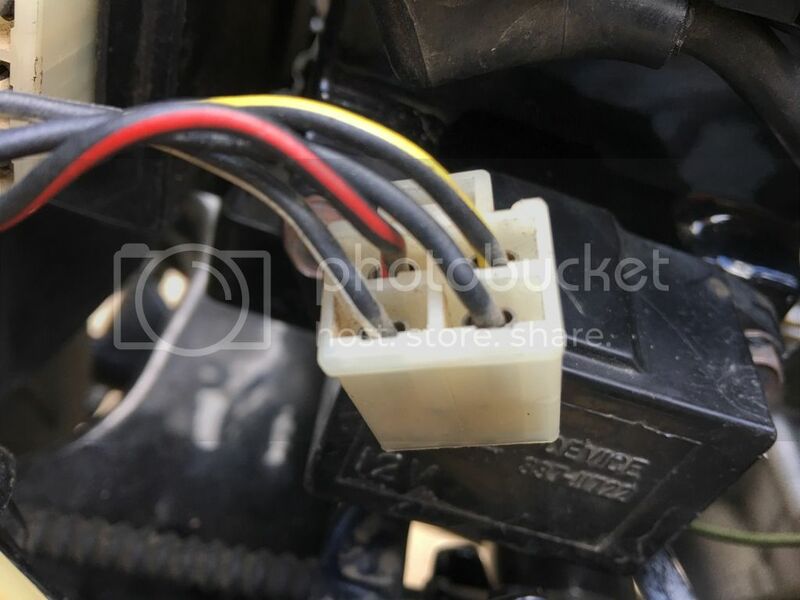 I noticed on my bike that the leads for the pickup coils under the stator cover are very long. In fact they could reach the ignition module without having to feed into the main harness. This is a big help later on when cleaning up the wiring. I highly recommend getting rid of the extra wiring. I started by removing the pins from the original connector going into the module, but the connector was too brittle and I ended up just using spade connectors directly onto the module for now. Below is my attempt to re-use the original connector. Next I un-taped the rat's nest of a harness (excluding the tail light harness) until everything was exposed. Start by removing the old harness for the original R/R unit. You will have to un-tape a couple of junctions, snip the wire, and re-wrap. I snipped the ground wire (black/yellow) and wound up using it for the ignition kill ground. I recommend not cutting the black/yellow wire too short until you get to this step. Next, isolate the wiring harness for the junction box. Tape up the blue and black/yellow wires for the fan and set them aside, as this will be relayed later. 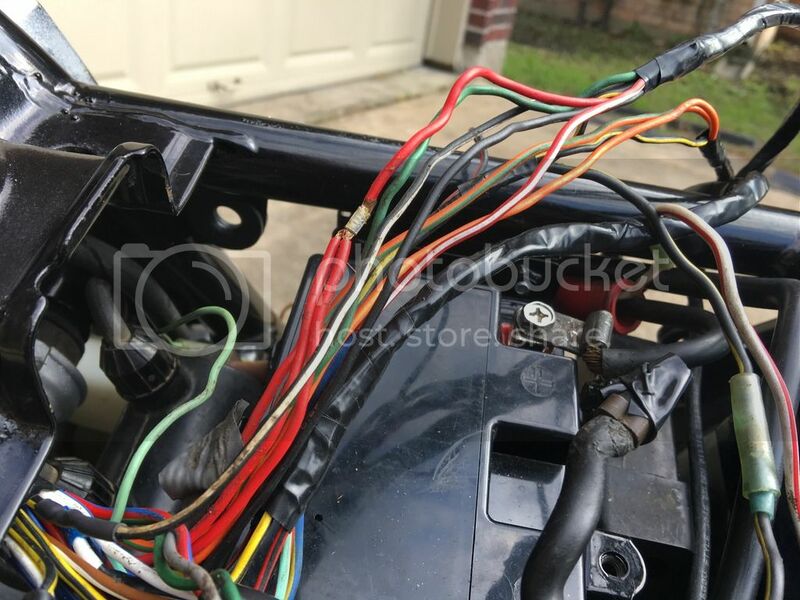 The black/red and yellow/red wires can be moved toward the right side of the bike closer to the starter solenoid. 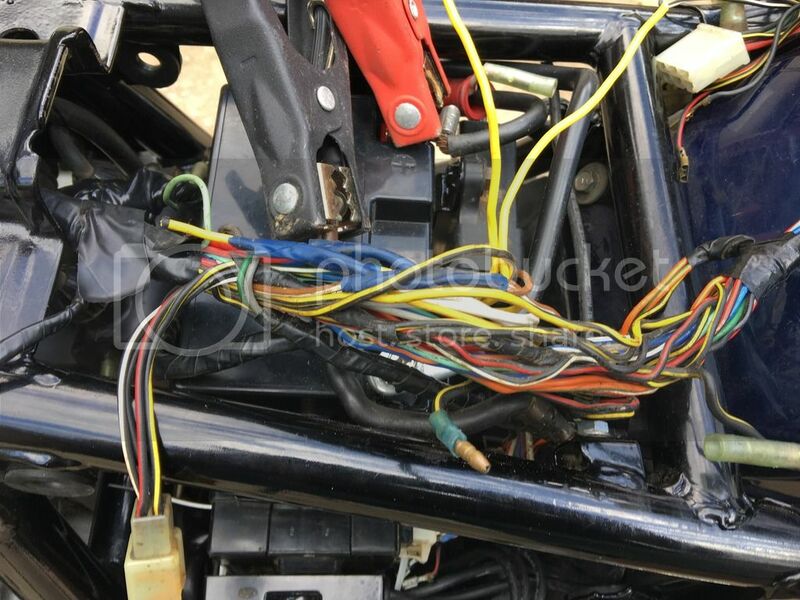 The main harness can be un-taped up towards the steering stem (if you want) and the green/white, black, and light green (don't accidentally cut neutral switch wire) can be cut. You can choose how far up the harness you want to cut them. The black/white wire will be grounded wherever you choose (I used the black/yellow wire for the R/R's original harness). The next step is to make a connector for the fuse box of your choosing. I got mine from Hondaman on the sohc4 forum for my CB750, but decided this was a better use for it. It's a 6 pin, use an 8 pin if you want to keep the accessory leads. The brown/white wire needs to be split to feed the headlight and tail light. See picture for detail. You can bolt the fuse box in place of the junction box like I did, or make a bracket for it and the relay(s). Next, untangle the 6 pin connector going to the ignition module and wrap it tightly with electrical tape. The tighter the better. See pic below. Like the previous step, wrap the leads going to the reserve lighting unit, but leave the blue wire going to the fuse box out. You should be able to tape up and route everything to your liking now. I would recommend looking at this junction and removing the one that feed power to the other 3 red wires and adding a relay. This will increase voltage at the coils, giving better performance. 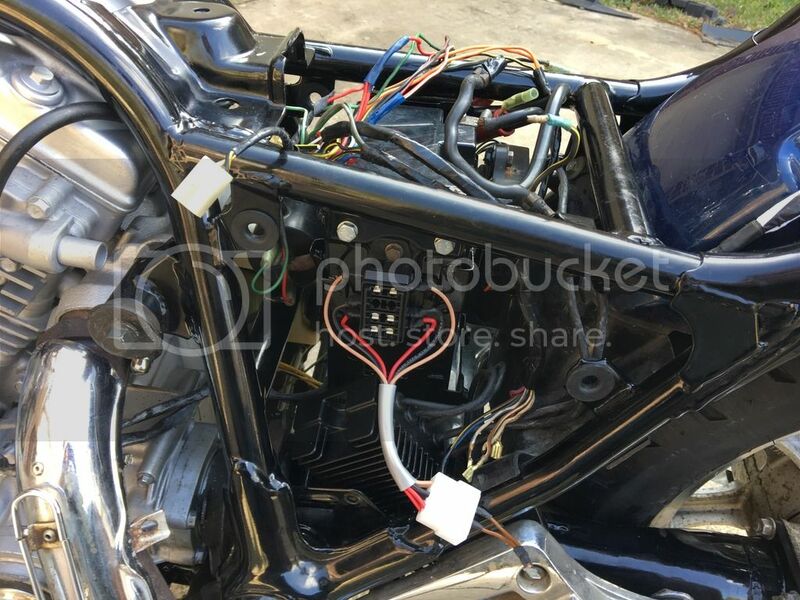 If you have removed the air box in favor of pods you can now route your harness under the tank, and with the ability to route the now split up harness you won't have to fight it to get the battery out. Last edited by mcinturff; 01-13-2017 at 12:54 AM. Fantastic write up and pictures, cheers buddy. 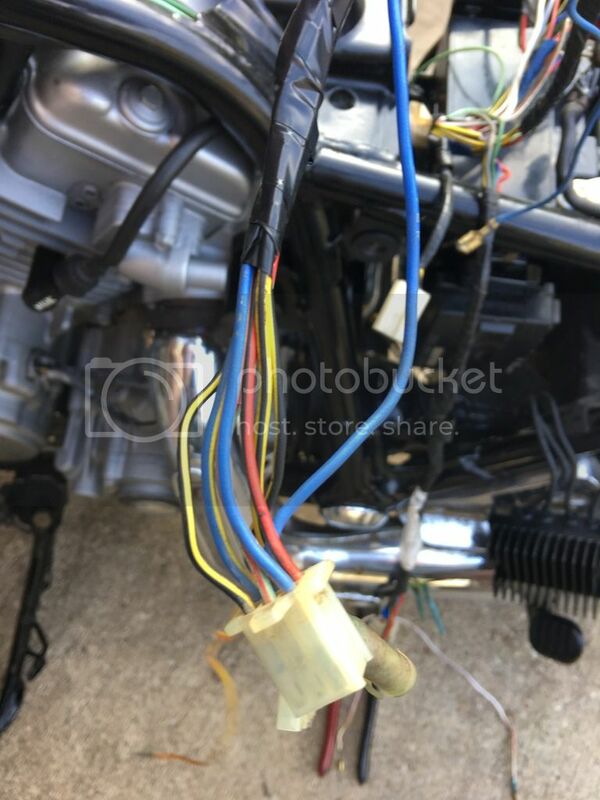 Must admit when it comes to auto electrics I struggle, the previous owner of my bike made such a mess of the wiring harness on my bike I ended up replacing it with one from eBay. I'll have to seriously consider this modification on my rebuild. Thanks again for sharing all your work, appreciated. Nice write up, thanks. Not sure how many are willing to do all that work, but nice to have the information here. Will be a sticky. You wrote "Be aware of the dangers of accidentally taking off with kickstand down or starting the bike in neutral!" Oops, that's what happens when you stay up late doing a write-up like this. If you had the fuse block handy you could do this in a day, maybe two. I will look into getting these pre-made for members. I will look into getting these pre-made for members. Good info, diagrams should be handy too. Been thinking for a long time, the JB is the root of most electrical/charging problems on this bike, and taking as much as possible away from the JB is the way to go. Shorts in the JB could be taking stators out, also there's one leg of 20-50v AC running in there. Next is a plan for the standalone fan relay, which I suspect the JB relay is intermittently pulling charge voltage down excessively in hot weather. Put it off since last summer, but now have a spare relay staring at me. 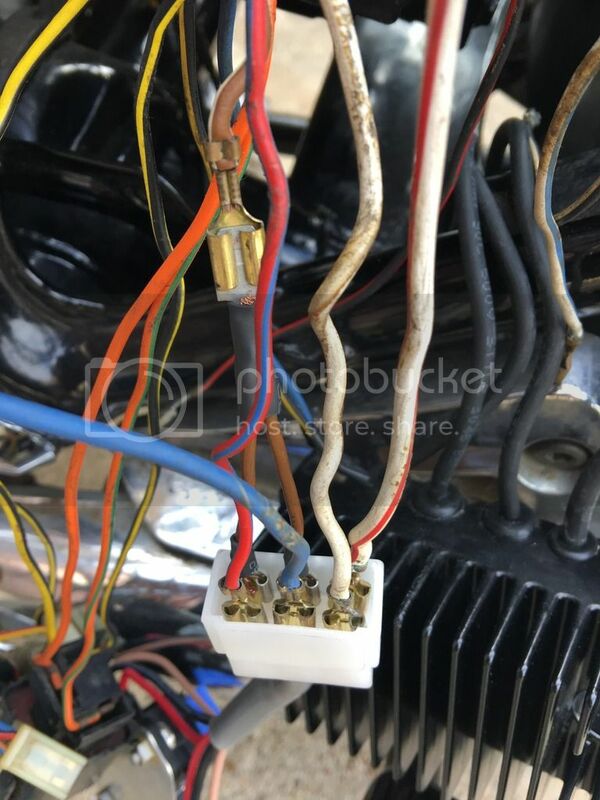 I'm lucky the plugs and wiring are still in decent shape, but have had a couple problems with loose spade connectors in the JB plugs. A little pinch fixes those. One killed the fan and the other made the headlight blink out. If the brownouts continue after my fan relay, this thread is my next stop. If all does well, I'll at least pull the pickup coil wires directly to the IC box. Cleaning my ignition switch fixed 50% of my problems. The other 50% were fixed when I bought the fastest Sporty on the planet. Question ! When you did this mod it get rid of the reserve lighting module ?